The level of plastic litter scattered across the world's oceans and seas has recently peaked, posing a serious threat to both human and animal life. We live in the age of plastic. From waking up in the morning to falling asleep at night, we are surrounded by a variety of disposable plastic items. The buttons on our pajamas are even made of plastic. Plastic came into our lives relatively recently, in the 1950s, but instantly gained extreme popularity bordering on addiction by becoming a convenient product – no washing or cleaning; just use and throw away. As such, it continued reigning our lives while imposing increasing pressure on the environment, natural habitat and human health. Plastic takes up to 100 years to decompose, and the lifespan of marine plastic litter exceeds ours. Tiny plastic pieces floating en masse across our oceans may often originate from the 1950s with potential to continue drifting for another 50 years. Plastic materials get into river and sea water and become marine litter when disposed of in sewage as waste. For sure, various measures are taken to ease its burden on marine life by reducing the discharge of plastic and improving land waste treatment with chemicals. Sadly, successful efforts on land to degrade plastic garbage have largely remained futile for the oceans. As a result, the drifting plastic continues to pose an increasing threat to seabirds, fish, mammals and vertebrates that live in the ocean and occasionally mistake floating leftovers of plastic packaging or disposed gas lighters, cocktail straws, shopping bags, kid's toys, etc. for food. Through this, they get exposed to the toxins in plastic as they decompose in their stomachs and intestines, since, before anything, plastic is a composition of chemical compounds. The effect of marine plastic litter on human health is largely secondary and results from our consumption of fish and seafood directly exposed to plastic. Still, recent research increasingly reveals high concentrations of microplastics in products included in our daily routine, like sea salt originating from the Southeastern Pacific where marine plastic pollution is the highest. 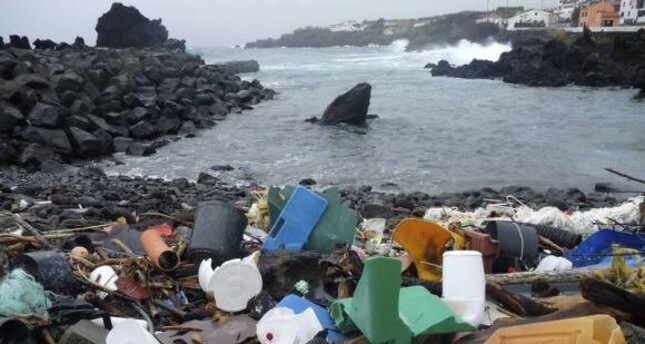 Powerful sea currents, storms, hurricanes and typhoons create massive gyres out of marine plastic litter that mix with the plankton and sea grass that seabirds, sea mammals and other saltwater inhabitants consume. Slow, steady whirlpools engulf all that drifts, largely plastic food wrappers, pieces of plastic bottles, disposable plates, cups, plastic combs and lighters, not to mention plastic straws and stirrers, and plastic-stemmed cotton buds and miscellaneous broken pieces of polystyrene. The largest of the gyres is the Great Pacific Garbage Patch, drifting near the coast of California, believed to date from the 1950s and having grown tenfold since then. Conflicting claims say that it is as deep as the Golden Gate Bridge, but more realistic estimates say it is nearly twice as big as Texas. For the Black Sea region, marine litter is growing in importance as a regional problem due to the nearly unique nature of the environment of this rather isolated body of water flanked by intense urbanization and widespread population growth. Marine plastics are high on the agenda of international agencies and initiatives, not to mention the littoral states engaged in Black Sea environmental protection. Among the matters of concern are the threats to small cetaceans like dolphins, the Black Sea's indigenous inhabitants, whose well-being, or lack the there of, acts as evidence of the state of the water reserve. Florence Descroix-Comanducci, the executive secretary of the Agreement on the Conservation of Cetaceans in the Black Sea, Mediterranean Sea and contiguous Atlantic area (ACCOBAMS), shared with Daily Sabah their perception of the matter while visiting Istanbul to attend the 34th Regular Meeting of the Commission on the Protection of the Black Sea against Pollution (BSC). The ACCOBAMS Permanent Secretariat headquartered in Monaco has become a full-fledged comer to the Black Sea region with Turkey's ratifying it earlier this year. The region is special for ACCOBAMS, and saving the Black Sea's dolphins from extinction is its goal. ACCOBAMS's mission is "to preserve Black Sea cetaceans by ensuring their good conservation and through addressing their threats. Cetaceans are an indicator of the environment status since they play a key role in the marine ecosystems, and their good status means a good status of the marine environment." In 2016, 23 countries, parties of ACCOBAMS, identified marine debris as a potentially key conservation issue, while research has revealed the predominant presence of plastics by 86.7 percent. "Marine litter is a highly critical issue, thousands of tons are discharged by rivers and along traffic lanes. Both big marine mammals like whales and small ones like dolphins are susceptible to marine plastic. Small dolphins eat plastic bags – they mistake them for jellyfish – and whales ingest microplastic, in particular fin whales because they live on plankton that eats microplastic, so then it's found in the flesh of the whales – not in the stomach. Large pieces of plastic debris could be found in the stomachs of sperm whales." The interaction of the sea mammals with marine litter is centuries-old, though poorly documented. Marine debris has become an issue of conservation rather recently. "We lack data. There is a gap in knowledge regarding the distribution and abundance of cetaceans in the Black Sea, though there is data about what happens along the coast of the Mediterranean and the Black Sea," Descroix-Comanducci said. To address the issue, ACCOBAMS is now engaged in an unprecedented large-scale project on the Mediterranean funded by international sponsors and certain countries. The ACCOBAMS Survey Initiative, known as ASI, is for establishing a harmonized "protocol for monitoring cetacean distribution and abundance with the final goal of reaching a good marine environmental status. Among the criteria is a need to monitor biodiversity, while cetaceans are one of the indicators of the environment status, and a good status of cetaceans means an absence of environmental problems. The beauty of this project is that it builds capacity. Scientists acting as observers of cetaceans in the latest Mediterranean campaign carried out this summer could undertake in the future a similar effort to survey the Black Sea as team leaders. Now, they are getting trained and will be able to train other scientists from the Black Sea region for a future survey project there." Eventually, a unified database will be established to cover the Mediterranean and later the Black Sea cetaceans, their abundance and distribution and their existing threats that would empower ACCOBAMS countries to take the necessary steps through practical measures in line with national legislation. ACCOBAMS's mission is to provide tools to the countries about how to address the threats to cetaceans, to monitor and mitigate them. Also, in collaboration with other international organizations, we are currently developing a joint common protocol for the necropsy of the stranded animals and particularly how to collect plastic material and how to report the data. This data can be used by scientists to better access the extent of the problem. Since ACCOBAMS is a regional approach, giving all its parties the same tools will help us to address the problems in a harmonized way. ACCOBAMS is also to build capacity about how to use these tools to facilitate the implementation of the measures by the countries." "I've heard about strong efforts made in the Black Sea area to upgrade water treatment plants to ensure that water released is clean," continued Descroix-Comanducci, adding, "I attended the 34th BSC Regular Meeting and was pleased by the work and reports of the countries on addressing marine litter. I think that they've come to understand the core of the problem and are working now on addressing the issue of marine litter." The world at large has come to understand that reducing our reliance on plastic is the only means to solve the problem. Fast-food giants like McDonalds and Starbucks have announced their intention to ban plastic straws from their outlets to limit amounts of plastic ending up in landfill and in the ocean. It means companies producing and selling all this packaging must take responsibility for it and take measures to cut down on the plastics ending up in our shopping bags. "Some countries have already made the decision to forbid the use of plastic bags and disposable plastic. We can all do something by not using plastic bags and avoiding disposable plastics. By reducing their use in the everyday life, we can contribute to the solution of this global problem," Descroix-Comanducci said in conclusion.